Albufeira is one of the most popular seaside resorts in the Algarve and a major European vacation destination. Located on the coast in the center of the region, about 36 kilometers west of Faro, the town is synonymous with tourism and boasts some of southern Portugal's best beaches. Once a quiet fishing village, Albufeira still retains something of its traditional character. The old town center is a maze of steep, narrow streets lined with whitewashed houses and fishermen's cottages that lead down to a fabulous beach. Evidence of Albufeira's Roman and Moorish heritage is scant, however, with only vestiges of the town's once-mighty castle walls visible. The original Arabic name of the town, Al-Buhera, means "Castle-on-the-Sea," and one or two buildings feature telltale Moorish arches. But as the tourist capital of the Algarve, modern Albufeira is a lively holiday hub of hotels, restaurants, and boutiques. Inland, away from the clamor, a more secluded Algarve is waiting to be discovered - countryside little changed by the advances of tourism. Albufeira is blessed with an outstanding choice of beautiful and unspoiled beaches (praias). Praia dos Pescadores is right on the resort's doorstep. Named for the colorful fishing boats that once decorated the beach (they now all berth at the marina) this family favorite is conveniently accessible by foot, but can get uncomfortably crowded in peak season. Alternatively, nearby Praia da Oura can be reached by following a scenic two-kilometer coastal footpath east out of the resort. Larger and less sheltered than its neighbor, this beach is a popular destination for windsurfers. Both beaches are served by an inviting array of seafront cafes and restaurants, and there are plenty of fun-packed activity options for water sports enthusiasts. Also close by is Praia de São Rafael, one of the best beaches in the Algarve and a wonderful pocket of sand enclosed by honey-hued cliffs that resemble wedges of gingerbread. Slightly more exclusive is picturesque Olhos da Água. Set five kilometers away from the center of Albufeira and connected by local bus services, the wonderfully named "Eyes of Water" is a small pocket of sand wedged in a half-moon cove. This is a great place for kids to explore when the tide is out; the ankle-high shallows and rock pools are a beachcomber's dream. Further east still is stunning Praia da Falésia. Set under ochre-hued sandstone cliffs topped with clusters of umbrella pine, this is one of Portugal's best beaches, renowned for its seemingly endless band of golden sand and shallow waters. You'll need a vehicle to reach the out-of-the-way location. Enhancing Albufeira's holiday resort credentials is the destination's swanky marina, located four kilometers west of the resort. The central focus of an upscale vacation apartment complex, the marina makes for an interesting diversion away from the busy town center. Fringed by a boardwalk lined with several cafes and restaurants, plus a number of retail outlets and busy market stalls, this is also the departure point for numerous sightseeing cruises, maritime excursions, and other adventure tourist attractions. High roping through a tree top assault course is the name of the game at this exciting and challenging Adventure Park. Participants must overcome a range of obstacles in order to complete the course, among them a giddy ropewalk and the daunting Monkey's Bridge. There's also an intricate cobweb to traverse, a vertical net to climb, and a zip wire to glide down. Located in verdant woods near Santa Eulália and Praia da Oura, the park consists of a series of games and trails set at varied heights between the trees. The course is designed to test stamina and motivation and allows participants to develop their own sense of responsibility as they move slowly through the canopy. There's a number of different adrenaline-pumping routes to attempt, each posing varying degrees of difficulty (some say playfulness). Fully trained personnel supervise every step of the way, with special initiation trails set up for active youngsters. As well as being great fun, this is an educational experience and helps promote awareness of the forest environment. The organizers can also arrange paintball tournaments for adult groups. Albufeira's boisterous hub is tacky, over the top, and absolutely irresistible. Named after an illustrious 20th-century Portuguese statesman and civil engineer, this modern pedestrianized square draws locals and tourists alike to its plethora of restaurants, cafes, and snack bars. It pays to browse the assortment of fashion boutiques for inexpensive summer garb, and it's worth investigating the handicraft workshops lining Rua Candido dos Reis for locally made souvenirs and a delightful selection of assorted vacation kitsch. An interesting cultural attraction is the Galeria Pintor Samora Barros, a noted contemporary art gallery that exhibits works by Portuguese and international artists. After dark, troupes of buskers and street artists appear to help entertain the throngs. The square is a short amble to Largo Cais Herculano, the town's bustling beachfront promenade, where a section of the original castle wall - now part of a restaurant façade - can be admired. While modest in scope, the exhibits on display at the archaeological museum in Albufeira encompass prehistory, the Roman, Islamic, and Visigoth periods, and the modern age. Set over two floors, the most interesting artifacts include Stone Age flint tools, fragments of mosaics unearthed from a nearby Roman villa, and a collection of weathered 16th-century keystones. The highlight is an impressive 10th-century Islamic silo, excavated while the premises still served as the town hall. The tiny, whitewashed church of St Sebastian is an understated cultural highlight of Albufeira. Consecrated in the mid-18th century, its exterior is distinguished by a decoration of flourishing Baroque stonework framing the main portal. Confusingly, the church's façade features a plaque dedicated to São Vicente - St. Vincent, the town's patron saint. Inside, visitors are regaled with a rare altarpiece of gilded wood surmounted by the rounded and ruddy faces of smiling cherubs. The nave doubles up as an ad-hoc museum of sacred art, and is also used for temporary exhibitions. One of the Algarve's great family entertainment options, Zoomarine stages spectacular dolphin shows and an amusing sea lion spectacle, among other daily performances. There's also a fascinating aquarium-museum to explore. A number of different habitats showcase exotic sea birds and majestic birds of prey. In addition, tickets allow entry to a fun-filled fairground and a fantastic aqua park complete with swimming pools for kids and adults and a giant water slide. Another highlight is the digitally animated film screened in the 4D cinema, which portrays a sea turtle's ocean-going journey. But the most magical moment is likely to be the opportunity to interact with bottlenose dolphins, where visitors can swim with these beautiful and intelligent creatures in a pool under the supervision of trainer. Lying somewhat off the beaten track, this wonderfully unpretentious theme park comprises a mini zoo and a string of leisure amenities ideally suited to those tourists traveling with youngsters. The idyllic countryside setting provides a pleasant contrast to the often-crowded coastal resorts, and the rural ambiance is tranquil and unhurried. Parents and children can say hello to an array of cute and cuddly domestic animals at the petting farm, while the reptile zone is home to exotic creatures like turtles, iguanas, alligators, and snakes, including a gigantic python. There are pony rides and bouncy castles for younger kids, and teenagers can test their driving skills on the moto-quad track. Meanwhile, budding golfers can practise their putting on the 18-hole mini golf course. And when it's hot, the swimming pools are especially welcoming. The atmospheric ruins of Paderne Castle sit in splendid isolation high on a hilltop deep in the Algarve hinterland. Built by the Moors in the 12th century, on the site of an earlier Roman fortification, the castle overlooks the Quarteira River where a well-preserved Roman bridge can still be crossed. The castle, however, has proved less impervious to the ravages of time. The still impressive outer walls remain, as do vestiges of the tower gate, but little else. The site, though, affords a glorious sweep of the countryside, especially evocative during spring when the slopes are flecked with flowers. Within the ramparts lies the ruined Chapel of Nossa Senhora do Assunção, built after Christian forces overran the Moors in 1248. The castle is situated near Paderne, a charming but sleepy smudge of a village that is worth a quick look before seeking out the castle. Visitors should note that the castle is unsupervised, and the steep dirt track leading up to the entrance should not be driven during wet conditions. EPIC SANA Algarve Hotel: luxury beachfront resort, beautiful pools, spacious suites, contemporary decor, kids' club. Vila Gale Praia: mid-range pricing, short walk to beach, outdoor pool, yoga room, full-service spa. Golden Beach by 3HB: 3-star apartment-style resort, sea views, comfy beds, lovely outdoor pool. Vale de Carros: budget hotel, bright rooms and apartments, pool and tennis court. Boat Tours: A popular tour from the marina is the Caves and Dolphin Watching Cruise from Albufeira. This two-hour excursion explores some of the caverns carved from the rugged sea cliffs. Along the way, keep an eye out for common and bottlenose dolphins that cruise the coastline. Another rewarding jaunt, and one with a fantastic fun factor, is the Leaozinho Pirate Ship Cruise from Albufeira. Kids can pretend to be Captain Hook or Long John Silver on this half-day or two-hour westward voyage along the picturesque Algarve coast. Albufeira's central location on the Algarve coast makes it a convenient place to stay for traveling farther afield. 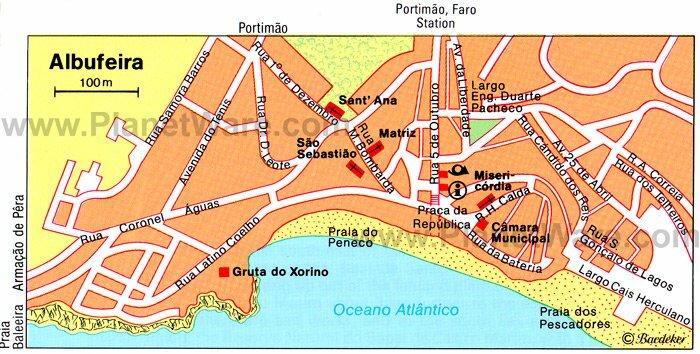 Portimão is an easy drive west, while in the other direction, Faro, the regional capital, is certainly worth a day out, not least to discover the beautiful Parque Natural da Ria Formosa. If golf is your preferred leisure pursuit, take a look at our Top-Rated Golf Courses in Portugal page. There are several excellent Algarve layouts listed, some of which front the most celebrated beach resorts in the country.